Noodles are the best type of comfort. Whether you prefer them spicy, with dumplings, vegetables, or plain in some type of broth, noodles make any place feel like home. For a belly full of noodles, check out these 10 awesome places in Ohio! Fukuryu was first established in Australia in early 2014 and journeyed to the U.S. in 2016. The recipes have been passed down from generation to generation and offer a classic, yet casual ramen and Japanese menu. Try a delicious bowl of Junk Ramen, topped with a sunny side up egg, chopped pork belly and includes everything but the kitchen sink! Another favorite is the Red Dragon Ramen with three levels of spiciness available. The Menya Noodle House offers true, authentic Japanese cuisine and features an original menu with unique creations such as the Black Tonkotsu and vegetarian ramen. There is also a children’s area where the little ones can play while the adults dine! Their Dipping Noodles are a particular favorite, featuring wavy dipping noodles with the option of soy, Tonkotsu soy or curry dipping broth. The philosophy of the Xinji Noodle Bar is quality and efficiency, featuring local farm raised products sourced from Northeast Ohio. They offer six specific noodle dishes to choose from: Wonton Ramen (a popular classic), Tsukemen (dipping noodle), Miso Ramen, Spicy Miso Ramen, Vegetarian Mazemen and Chicken Mazemen. Be sure to try one of these with the Kimchi Balls! They’re great for dipping! If you’re in the market for quick, fresh and authentic Japanese food, look no further than the Tenuske Express in Columbus! The atmosphere is calm yet cheerful, and offers both dine-in and carryout. With each noodle dish, choose your level of spiciness: mild hot, medium hot, fire, or ghost. Each dish can be customized with some of the following toppings: vegetables, kitsune, beef and onion, or beef curry! The Fortune Noodle House in Cincinnati specializes in a specialize technique that dates back to the early 1500s, known ‘La Mian,’ or hand pulled noodles, which are made by stretching and folding the dough into strands and can be made into various lengths and thicknesses. The dough is made using the freshest flour, making them absolutely perfect. Try them pan fried with vegetables or shredded chicken, or in a mixed sauce with fried beans, meat, tomato, egg or shredded pork and green peppers! Noodles never tasted so good! Here are at Pho96, the noodles come either Vietnamese style or dry (cold). Combine them with tofu, grilled shrimp, bean curds, brisket or flanks, and so much more! There are so many different ways to try the noodles here at Pho96! Hurry in and get your choice today! Be sure to pair them with a delicious appetizer, such as the Green Papaya salad and beef jerky. The Otani Noodle is Cleveland’s most popular fast paced Ramen shop, where diners are encouraged to sip the broth, slurp the noodles (yes slurp) and then dig into the roasted veggies and broth-soaked meats. The Jigoku bowl comes with roasted pork and Ramen noodles topped with your choice of scallions, kikurage mushrooms, seaweed, corn, or a boiled egg and is for those who like a little kick with their dish. You’ll find all your favorites here at the Ando Japanese Restaurant and Sushi Bar. Ando has been open since 1998 and preparing and serving amazing, classic and authentic Japanese cuisine made with love. The menu changes based on seasonal ingredients so that each dish is made with the freshest of ingredients. The udon noodles are a popular dish, made with thick and chewy wheat noodles in a warm, made from scratch broth topped with fishcake, scallions and freshly branched spinach. Another classic favorite is the traditional Ramen noodles, featuring bamboo shoots. The Taiwan Cuisine Toledo features an assortment of flavors and dishes from the traditional Taiwanese, as well as Singapore, Japan and Mongolia. Located just eight minutes from the main campus at the University of Toledo, it’s a popular destination for college students. 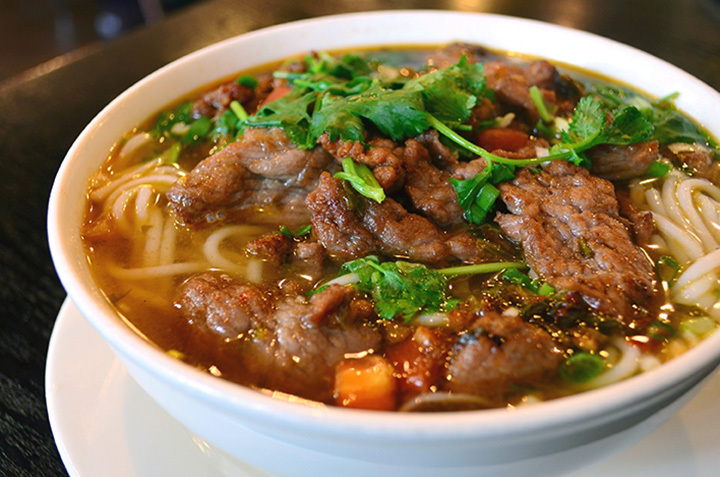 Try a bowl of traditional Taiwanese Beef Noodle Soup or the House Special Lo-Mein, made with your choice of chicken, beef, or shrimp stir-fried with the softest, melt in your mouth noodles! The pictures alone are enough to make your mouth water here at the Wild Ginger Sushi Asian Fusion Restaurant in Hilliard, Ohio. The restaurant features authentic Asian and Japanese dishes, from traditional to outside the box. For something a bit more ‘exotic,’ try the Pineapple Fried Rice Noodles or the ridiculously spicy Singapore Fried Rice Noodles! Another favorite: the Big Bowl Noodle Soups, including the House Special Udon or the Roasted Duck.